TUG XXL super heavy duty industrial tugger, tower, puller, pusher. Walk behind pedestrian tugger. 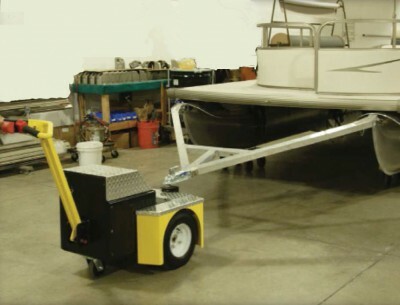 The most heavy duty battery powered tugger for moving up to 50,000 lbs. Like the Tug XL, this “big brother” XXL is also a feature loaded industrial tugger. The XXL is recommended for the largest projects. Even as the “big brother” it still has much greater maneuverability and is much more ergonomic than other equipment designed for jobs this big. The Tug XXL has a range of hitches similar to those listed at the Tug XL. So, the XXL will be able to move most any load, roll stock, cart, or products. If we have to develop a new hitch for your project we can certainly do that. 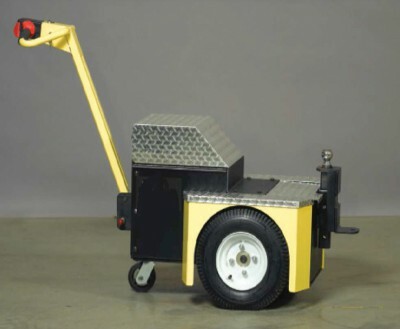 The standard features on the Tug XXL battery powered mover includes: ergonomic handle, thumb controls, safety switch, safety horn, key switch, onboard charger, maintenance free tires, emergency stop, battery indicator gauge, and more! If this machine is not enough to solve your needs, we can help with a custom solution. Give us a call or send an email so we understand your requirements and can provide a cost-effective solution for you.